2014년0 2월 05일 ~ 02월 07일 강원도 용평리조트에서 제10회 한국유전체학회 동계심포지엄이 개최되었습니다. 저희 (주)신테카바이오도 함께한 이번 심포지엄의 주제는 "Working with ENCODE Data" 였는데요. "Working with ENCODE Data" Workshop은 인간 유전체 기능연구를 위한 다양한 분석 data를 제공하고 있는 ENCODE Project (ENCyclopedia of DNA Elements)에 대한 전반적인 이해와 학습을 목표로 개최되었습니다. 이 분야의 전문가인 Dr. Robert Kuhn (UCSC)과 Dr. Emily Pritchard (Ensembl)가 UCSC와 Ensembl Genome Browsers에서 ENCODE Data를 분석하는 방법을 알기 쉽게 강의해 주시기도 했습니다. 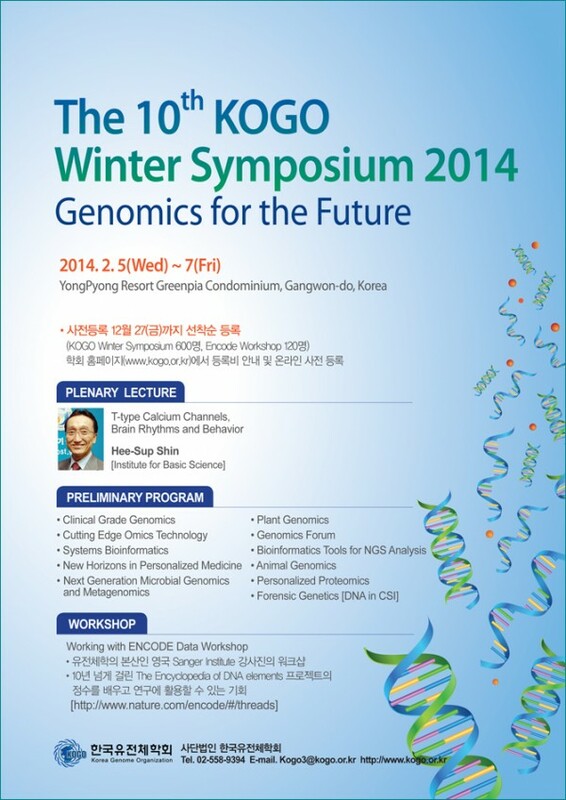 Clinical Grade Genomics / Plant Genomics / Cutting Edge Omics Technology / Genomics Forum / Systems Bioinformatics / Bioinformatics Tools for NGS Analysis / New Horizons in Personalized Medicine / Animal Genomics / Next Generation Microbial Genomics and Metagenomics / Forensic Genetics(DNA in CSI) 라는 다양한 주제로 프로그램이 마련되었고 Bioinformatics Tools for NGS Analysis에서 저희 신테카바이오 정종선 박사님께서도 "ADISCAN (Allelic Depth Imbalance Scanning) for ProteoGenomics Application" 라는 주제로 강연을 하셨습니다.